The Atlanta Gas Light (AGL) worksite on Wood Trail Lane is in full swing. The project will replace older pipes to ensure safety and continuity of service. We first heard about this project last fall (October 2011 MANA community meeting). Ongoing work at Wood Trail Lane. Click to enlarge. AGL shared the information below for distribution to our neighbors. AGL representatives will attend the MANA community meeting next October 22.
Who is Atlanta Gas Light? Atlanta Gas Light delivers natural gas on behalf of approved gas marketers to residences and businesses in your community. We safely operate and maintain a natural gas pipeline system over 55,000 miles long that delivers reliable, environmentally friendly natural gas to more than 1.5 million customers across Georgia. Why is Atlanta Gas Light working in my area? The Pipeline Replacement Program (PRP) is a 15-year project which began in 1998 to replace more than 2,600 miles of bare, or unprotected, steel and cast iron natural gas pipeline in Georgia. To ensure the safety and reliability of Atlanta Gas Light’s natural gas pipeline system, older pipes are being replaced with state-of-the-art plastic and steel pipes. The program will be completed in 2013. Atlanta Gas Light was one of the first gas utilities in the nation to begin a comprehensive pipeline replacement program. The company’s program has since become a model for other gas companies. PRP is just one of many initiatives undertaken by Atlanta Gas Light during its 155-year history as we work to bring you and your neighbors’ environmentally friendly natural gas. What are the benefits of the Eastside Pipeline? The Eastside Pipeline will replace a pipeline that dates back to the 1950s. By taking the old line out of service and putting in a new coated steel pipeline, Atlanta Gas Light will help ensure the continuing safe operation of our system which serves homes and businesses with natural gas. The Eastside Pipeline, along with other PRP and pipeline installation projects, will contribute to the reliability and integrity of the overall system. What is the route for the Eastside Pipeline? The 24-inch pipeline will run approximately 28 miles from our Riverdale LNG (liquefied natural gas) facility in Clayton County to a connection point in our transmission system near the intersection of Buford Highway and Clairmont Road in DeKalb County. Construction will include several interstate and railroad crossings. The route primarily follows existing Atlanta Gas Light easements and public right-of- way, and was selected to help minimize disruptions where possible in local communities. Has any of the work on the Eastside Pipeline been completed? Preconstruction activities, including surveying and environmental studies got underway in the second half of 2011. Some surveying activities will continue for the duration of construction. 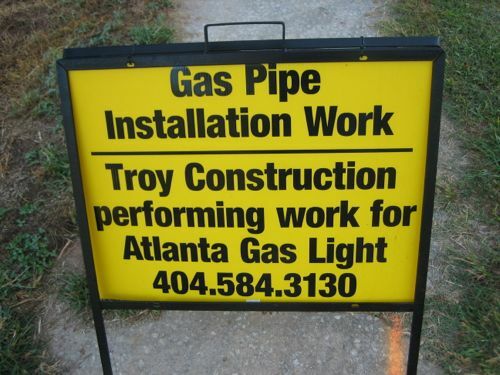 Additionally, Atlanta Gas Light has engaged the communities where construction will take place, including notifying property owners on the route prior to pre-construction activities, reaching out to elected leaders, and meeting with neighborhood associations, community groups, and residents in the areas where construction will occur. General Surveying – Contractors will mark the boundaries of Atlanta Gas Light’s existing easement and/or areas where additional easement may be needed with flagged stakes. In areas where Atlanta Gas Light does not have access rights to the property, our contractors will request survey permission from the owner. Underground Utility Surveying – This type of surveying takes place along the road or in public right-of-way and involves locating underground utilities, such as water, sewer and telecommunications that may be along the pipeline route. Workers will use specialized locating equipment around manhole covers or along the road and, in some places, may have to excavate a small area of the road or right-of-way to locate a utility. Excavated areas will be restored to county standards. - Should the underground surveying work require a lane closure, traffic control measures will be used to help drivers navigate around the work area. - Property owners may also notice crews going by several times for this specific type of survey work so that the surveyors can gather all the necessary data on underground utilities. Environmental Studies Surveying – This work will primarily take place within Atlanta Gas Light’s existing easement to determine whether there are any environmentally sensitive areas along the route in accordance with state and federal regulations. If the studies need to expand beyond our easement, our contractors will request survey permission from the owner. What is the route of the pipeline in Clayton County? The pipeline will run approximately 81⁄2 miles in a northeasterly direction in existing Atlanta Gas Light easement and public road right-of-way from the liquefied natural gas facility (LNG) in Riverdale to the county line with Fulton County where it divides the City of Atlanta from the City of Forest Park. The route will cross several roads and highways including Highway 138, Upper Riverdale Road, I-75, Old Dixie Road, Forest Parkway, and Jonesboro Road. 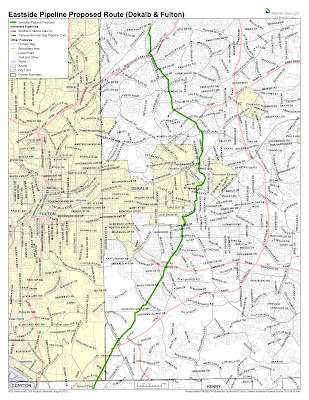 What is the route of the pipeline in Fulton County? A small portion (less than a mile) of the Eastside Pipeline runs through the southeast corner of Fulton County between the Clayton and DeKalb county lines. This piece is wholly within the city limits of Atlanta. The route is within Atlanta Gas Light’s existing easement west of I-285. Clayton/Fulton Route. Click to enlarge. 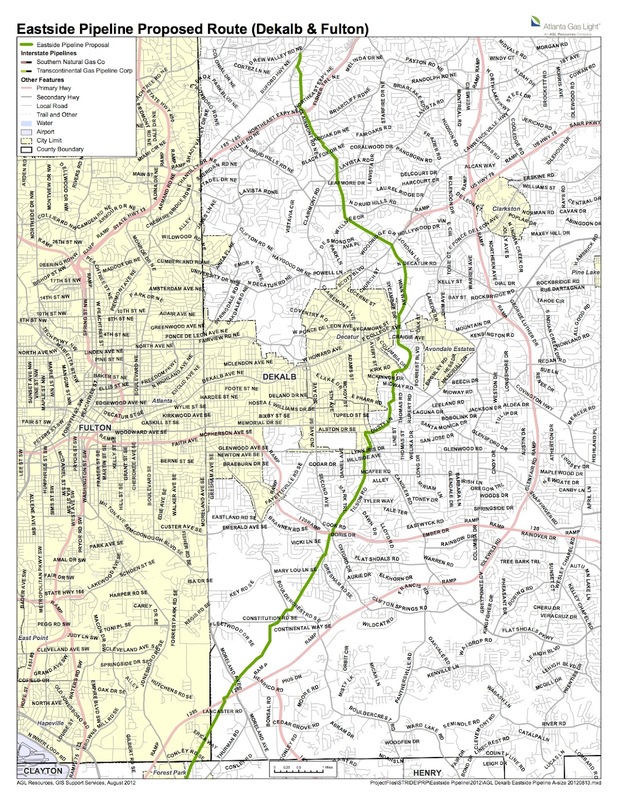 What is the route of the pipeline in DeKalb County? 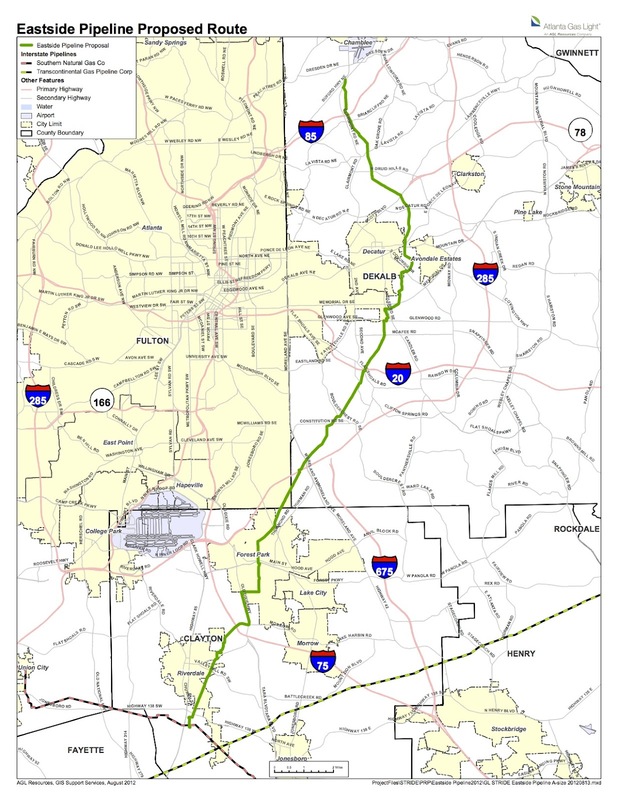 Approximately 18 miles of the pipeline will be installed in unincorporated DeKalb County, the City of Atlanta within DeKalb County, and the City of Decatur. Coming out of Fulton County, the pipeline route will continue cross country in the existing Atlanta Gas Light easement and proceed in a northeasterly direction crossing several roads and highways including I-285, Moreland Avenue, I-20, Glenwood Avenue, Candler Road, and Memorial Drive. Part of the installation will also be in road right-of-way in the City of Decatur and along Arcadia Avenue and DeKalb Industrial Way. At the intersection of Lawrenceville Highway and DeKalb Industrial Way, the route will return to an existing Atlanta Gas Light easement and continue to the intersection of Clairmont Road and Buford Highway crossing North Druid Hills Road, Lavista Road, and Briarcliff Road along the way. Eastside Pipeline Proposed Route. Click to enlarge. What is an easement? An easement or right-of-way is a contract made between parties to give an individual, a company, utility or government entity the right to use a landowner’s property for a particular purpose; in this case, Atlanta Gas Light’s right to operate, maintain and, if necessary, replace or add a natural gas pipeline. In granting rights, an easement has the effect of partially restricting a landowner’s use of that part of the land affected by the easement. Easements are recorded in the county land records and remain in place even if the land is bought and sold. These pipeline easements are permanent in nature. While the pipeline may be maintained or installed within the permanent easement itself, Atlanta Gas Light may temporarily require additional work space in order to perform the work and accommodate heavy equipment. For these short- term uses, Atlanta Gas Light will acquire from the landowner a temporary construction easement. While these easements are also recorded in the land records, they are limited to a specific period of time. After construction has been completed, the term of the temporary construction easement would expire and crews would restore the utilized property. When will construction get underway? Construction on the Eastside Pipeline will be completed in different phases in 2012 and 2013. 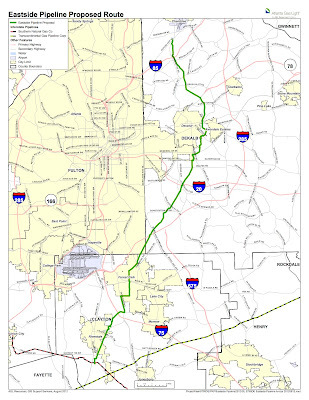 In the second half of 2012, approximately 12 miles of pipeline in DeKalb County is slated for construction from just south of Glenwood Avenue (west of Candler Road) to the connection point with the existing transmission system in the vicinity of Buford Highway and Clairmont Road mostly through unincorporated DeKalb County with a small area of work in the city limits of Decatur. A small portion of the pipeline (approximately 4,000 feet) was installed between North Druid Hills and Lavista Roads in the first half of 2012 in conjunction with a Georgia Power easement project. In Clayton County, approximately three miles of pipeline will be installed from our Riverdale LNG facility (liquefied natural gas) to Upper Riverdale Road. It will go through unincorporated areas of Clayton County as well as the City of Riverdale. Construction on these sections of pipeline is expected to last into the second half of 2013. In early 2013, installation of the remainder of the Eastside Pipeline – from Upper Riverdale Road to the Glenwood Avenue area – will get underway. This part of the pipeline will go through the City of Forest Park, the City of Atlanta, and unincorporated DeKalb County. Completion of the pipeline installation is expected to last through 2013. Once the pipeline is installed, there will be additional work in some areas to connect the new pipeline to Atlanta Gas Light’s existing distribution system. 9) restoring the right-of-way to its pre-construction condition. As with all of our construction projects, safety is our top priority. Great care will be taken in all phases of the project from beginning to end in each neighborhood. We will make every effort to minimize inconveniences to property owners along the route. How will I be notified about construction? Property owners along the pipeline route will receive a letter from the company before construction begins. If you have any questions that are not answered in this document or future communications from the company, you may contact us directly at 404-584-3130 or eastsidepipeline@aglresources.com. Additionally, Atlanta Gas Light is meeting with community leaders and groups, fire and police officials, and others to ensure that they are well-informed about our project and what to expect during construction. How can I get more information about the Eastside Pipeline project? Atlanta Gas Light field staff will be on-site throughout construction activities if you have any questions about our replacement project. 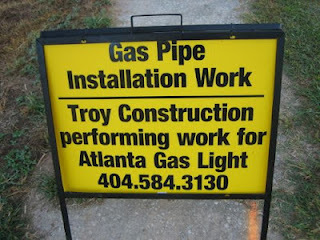 You also may contact Atlanta Gas Light directly at 404-584-3130 or visit our project web page at www.atlantagaslight.com/eastsidepipeline.